In comments one of our many Anons contributes some additional links (here, and here) to our extensive Founders coverage. Unpaid taxes seem to be the latest issue. Update: Regular commenter Behemoth points us to the latest story from The News & Record - who have been on this Founders story like a duck on a junebug - which says Founders owner Tamara Fuller has been hit with an $8.2m judgement in another of her businesses. That's gotta hurt. It's sad to see, but with consistent news like this, it's hard to see this endeavor lasting much longer. Objectivists don't ~*~believe~*~ in taxes, silly! I believe in a small sales tax. In fact, I don't see how voluntarily financed government (ie no tax at all) fits with Objectivism at all. I'd be outraged to put my money toward the protection of individuals who contributed nothing at all. It'd be a free ride. Why not solve the dilemma with a small sales tax? It's still mostly voluntary since you only pay when you buy stuff. I bet if you got most Objectivists off the record they would agree. How can you say even a small sales tax is justified? Don't you know in any compromise you're just mixing a little poison in your food. You're sounding like those immoral arch-enemies of freedom, the Libertarians! Don't you see that once the whole society has adopted Objectivist philosophy, they will all see the rational benefit in contributing voluntarily, and the dreaded "free-rider" economic problem - which is merely the other side of the corrupted coin of collectivist altruism - will shrivel away like a husk. Of course, if society does not ultimately adopt Objectivist philosophy, it will not be worth defending, and deserve to perish like all the other social-metaphysical compromises with reality. See that's the thing, I don't see it as a compromise. I think this was Ayn Rand miscalculating within her own philosophy. Under a totally voluntary system, some people will inevitably contribute way more than others. Therefore the only way to ensure that everyone who has individual rights pays for their protection - at least in principle - is some kind of nominal tax. Far from being an immoral compromise, it's the only way to ensure that this takes place. How is that any different? Even if the government was financed by sales tax, you would still be forced to put your money toward the protection of individuals who contributed nothing. Assuming you buy stuff from the money you acquired through means of rational production, you are paying money to the government, which then serves all individuals, even people who do not have their own income or buy their own stuff. What about Rand's idea of a user fee on contracts? I haven't read that essay in a long time. The main problem I saw was that even a minimalist government needs some kind of predictable operating budget with which to pay its people. I don't see how that could be achieved if financing was done ad hoc on the fly. >The main problem I saw was that even a minimalist government needs some kind of predictable operating budget with which to pay its people. I don't see how that could be achieved if financing was done ad hoc on the fly. Check your premises. This is why Objectivism doesn't demand a mere political revolution, but profound philosophical one. It's not a war over fiscal policy, it's a war for men's minds. You will not recognize society once the last altruist anti-concept has been wiped from the page of history - so you certainly can't base your assumptions on the way people act in our current debased, "mixed" culture. 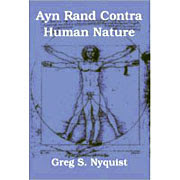 Once man is fully rational, when the basic Objectivist premises of reason and reality are fully accepted, man will be able to act according to his true nature, and things like government fiscal policy will not require the gangs of armed thugs to rob the productive at the point of gun, as happens every day in today's society. Like Gresham's Law in reverse, man's natural currency of rational benevolence will no longer by driven out by the counterfeit coin of altruism. Plus voluntary contributions will be so much easier for individuals to make; given the massive productivity that will be unleashed by truly unfettered capitalism, incomes will be so much greater that such contributions will be tiny by comparison! But this new world, the world we dream of, is real, it can be yours...but onlyif you refuse to compromise your fundamental principles, such as the NOIF principle. Any compromise with evil is a victory for evil; and, there only being black-and-white ways of dealing with principle, a sales tax, no matter how small, is as black in philosophic principle as the blackest Nazi regime! I know you're trying to make that sound as dry and removed from the life we know as possible. But be fair: we haven't had a government like that since the Founding Fathers. For all I know, small voluntary contributions would suffice. Though I must say, I had a hard time not laughing while I read that in class. pardon me - one of those Anons, again - but this academic discussion about sales taxes & voluntarism is IMHO massively beside the point. Or is it easier to talk about All That and ignore the elephant in the corner, namely a classic case of smoke blown up the orfices of the willing? ARCHN's constant efforts to act as the "dissident press" are to be complimented, but this little soap opera has more ethical implications than political ones. >Or is it easier to talk about All That and ignore the elephant in the corner, namely a classic case of smoke blown up the orfices of the willing? You should hear some of the stuff we've been hearing, OOTAA. Maybe we'll post on it soon. Question #5 also refers to an imaginary "ARCHNA Consulting Group"